Strongman is a weight-classed strength sport. In competitive strongman and strongwoman, an athlete’s success is based on their ability to conquer a multitude of events. Unlike the other strength sports, strongman/strongwoman athletes have to incredibly rounded in every aspect, as opposed to only training a few lifts. Check out a few of the more well-known events below. These are only a few of the events you could see at any given strongman contest. To be successful in strongman and strongwoman, you have to be adaptive and excel in pull, carry, press, and squat focused events. 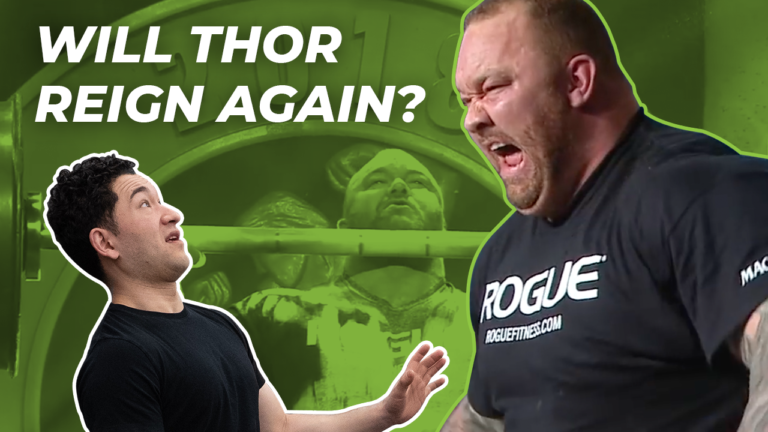 Can Hafthor Bjornsson Take It All? Can Hafthor Bjornsson Win the 2019 Arnold Classic AND World's Strongest Man? Need direction? Check out this insightful article discussing how one should keep their strongman training in perspective! Need an Atlas Stone alternative? Try out Sandbag Training! Stones in strongman competitions are event staples and can come in multiple forms. In fact, stones, strongman, and strength sports in general have an incredible history with stones and their usage. For example, there’s the legendary Husafell Stone that resides in Iceland and the Dinnie Stones that sit firmly in Scotland. In strongman competition, the most popular stones used are the Atlas Stones. These stones can be used in medley, maximal, and endurance style events. Atlas Stones GuideGet to lifting! Atlas Versus Stones of SteelWhat Are the Major Differences? 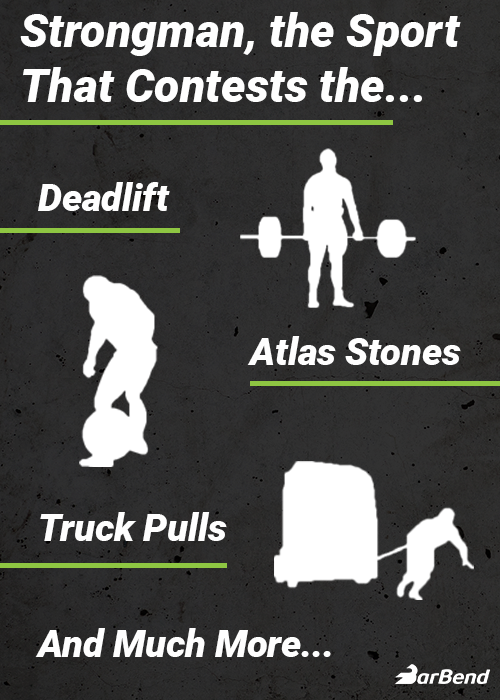 Outside of the sport of strongman, stones can be a useful tool for every type of athlete. They are an odd object, so they require ample grip, strength, and power to properly lift. A lot of gyms lack stones, so the next best thing is often using sandbags, which will offer a lot of the same benefits. Check out the benefits and how to properly train with sandbags! Another popular form of event that strongman and strongwoman athletes often partake in are loaded carries. Like stones, loaded carries can come in multiple forms and the most popular events are the yoke and farmer’s carry. The yoke carry involves an implement that lies across the back in a similar position to where a barbell sits in the back squat. Athletes can perform yoke carries for distance, or compete in a relay style timed event. Farmer’s carries are an event that require athletes to lift and walk with a surpamaximal weight for distance. Farmer's WalksThe Best Grip Exercise? Yoke and Farmer’s carries are great exercises for every type of athlete. They require the full body to work in unison in order to lift and move the maximal loads being carried or held. This makes them great for full body muscle growth. On top of building strength, yoke and farmer’s carries can be a useful tool for conditioning. Need more convincing? Here are seven major benefits of Farmer’s Walks! The deadlift in strongman is a legendary and always popular event. In competition, strongman and strongwoman athletes can perform deadlifts with maximal weight, on an axle, or for reps — anything can go! Who Holds the Strongman Deadlift Records? Currently, Eddie Hall holds the deadlift world record with his massive 500kg deadlift performed in 2016. Icelandic strongman Hafthor Bjornsson currently holds the Elephant Bar world record. Deadlift GuideClean Up Your Pull! Strongman Deadlift Cheat SheetAre You Leaving Gains On the Table? It’s important to note that in the sport if strongman, rules for deadlift events can vary. For example, in some competitions straps and suits will be allowed, and in others athletes must lift raw. You probably don’t need much convincing on the importance of deadlifting in strength sports and for overall strength development. Although, if you need more reasons to deadlift, then here are 13 undeniable benefits of deadlifting. In the sport of strongman, you’ll be hard pressed to attend a competition without at least one pressing event (pun intended). Press events can be performed with a log, Cyr dumbbell, or any other implement that can be pressed for reps or maximal loads. Even if you don’t compete in strongman or strongwoman formally, training with a log, or with other strongman-style pressing variations can have carryover to your sport. To train the press in strongman, it’s suggested to train with multiple types of implements. For example, using a barbell, dumbbell, Cyr dumbbell, log, and axle can all be beneficial. Who Holds the Strongman Log Press World Records? For the men, legendary strongman Zydrunas Savickas holds the current Open log press world record with a monstrous 228kg press. In the 105kg weight class, Rob Kearney holds the world record with a 186kg press. Fort the women, Strongwoman Kristin Rhodes holds the Open log press world record with a 113.4kg press, and Alanna Casey holds the -82kg log press world record with a 95.4kg press. To help improve our strongman content, we’ve brought in some of the industry’s top coaches, mind, and experts. Check out a couple of the BarBend strongman experts above! If you’re interested in the full list of experts that help curate and verify BarBend content, then visit our BarBend expert page!